On Friday, April 8, at 9:00 a.m., St. Stephen Lutheran Church volunteers planted seeds with the residents at St. Luke’s Living Center. The “Planting of the Seeds” project began on March 2, when St. Stephen’s received approval from Thrivent Financial for seed money for the service project. Thrivent is a not-for-profit membership organization, and they offer more than financial services. Thrivent creates financial strategies that help Christians to be wise with money and live generously. On March 16, several St. Stephen church members visited St. Luke’s Living Center to begin the project. With an initial walk-through, weed killing and pulling, the project began. From March 17 through April 7, the volunteers cleaned up in the courtyard, pressure washed, painted tables, purchased supplies, and distributed mud. 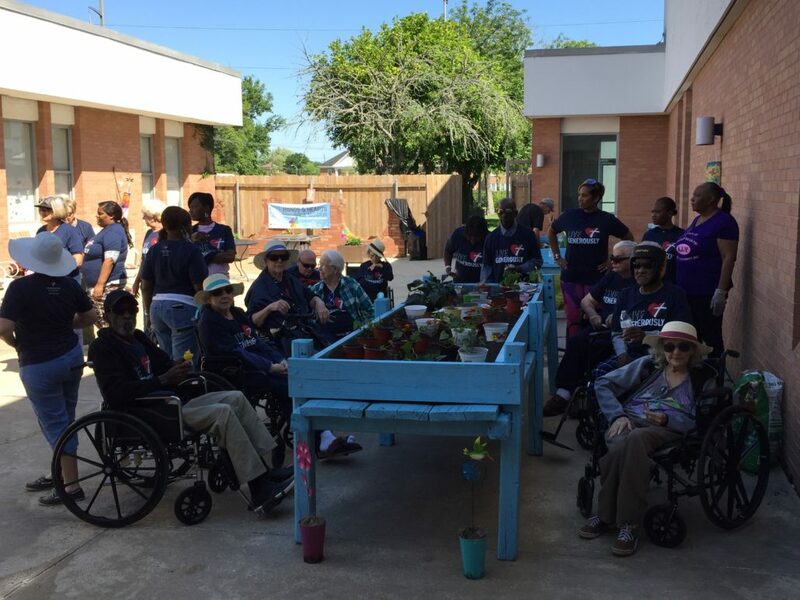 On the big service day, the volunteers and residents worked together to create a beautiful courtyard and other garden decor. 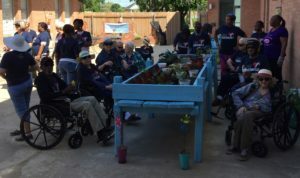 Over fifteen volunteers from St. Stephen Lutheran Church and several members of Kappa Epsilon Psi Military Sorority spent over 30 service hours during the “Planting the Seeds” project. 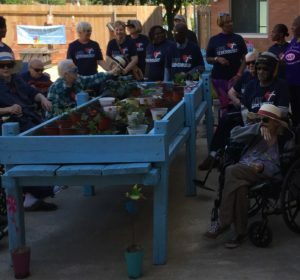 Not only did the volunteers enjoy creating a beautiful space at St. Luke’s, but they also enjoyed brightening the day of six residents who helped plant seeds. Thank you to Lowe’s on Manhattan Blvd., for a generous discount on seeds, plants, and supplies; Tammy Switzer, Social Director at St. Luke’s Living Center, for helping to organize our project; and the many volunteers who helped to make our project happen. St. Stephen Lutheran Church is an LCMS congregation located in the Algiers section of New Orleans. Please join us for worship on Sundays at 9:00 a.m., followed by adult Bible study at 10:30 a.m. There is another adult Bible study held on Tuesday mornings at 9:00 a.m. Children’s church is held during Sunday morning worship after the children’s sermon.